The "main Axis" of the coordinate system is the axis of revolution of the cone. The plane defined by the origin, the "X Direction" and the "Y Direction" of the coordinate system is the reference plane of the cone. The intersection of the cone with this reference plane is a circle of radius equal to the reference radius. Its "main Direction" is the v parametric direction of the cone. R is the reference radius. A3 defines the local coordinate system of the conical surface. Ang is the conical surface semi-angle. Its absolute value is in range ]0, PI/2[. Radius is the radius of the circle Viso in the placement plane of the conical surface defined with "XAxis" and "YAxis". The "ZDirection" of A3 defines the direction of the surface's axis of symmetry. If the location point of A3 is the apex of the surface Radius = 0 . At the creation the parametrization of the surface is defined such that the normal Vector (N = D1U ^ D1V) is oriented towards the "outside region" of the surface. 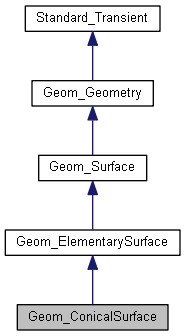 Creates a ConicalSurface from a non transient Cone from package gp. Computes the apex of this cone. It is on the negative side of the axis of revolution of this cone if the half-angle at the apex is positive, and on the positive side of the "main Axis" if the half-angle is negative. The conical surface is infinite in the V direction so V1 = Realfirst from Standard and V2 = RealLast. U1 = 0 and U2 = 2*PI. returns a non transient cone with the same geometric properties as <me>. Creates a new object which is a copy of this cone. Computes the point P (U, V) on the surface. P (U, V) = Loc + (RefRadius + V * sin (Semi-Angle)) * (cos (U) * XDir + sin (U) * YDir) + V * cos (Semi-Angle) * ZDir where Loc is the origin of the placement plane (XAxis, YAxis) XDir is the direction of the XAxis and YDir the direction of the YAxis. Nu or Nv is negative. Returns the reference radius of this cone. The reference radius is the radius of the circle formed by the intersection of this cone and its reference plane (i.e. the plane defined by the origin, "X Direction" and "Y Direction" of the local coordinate system of this cone). If the apex of this cone is on the origin of the local coordinate system of this cone, the returned value is 0. Returns the semi-angle at the apex of this cone. Attention! Semi-angle can be negative. Changes the radius of the conical surface in the placement plane (Z = 0, V = 0). The local coordinate system is not modified. Raised if R < 0.0. Changes the semi angle of the conical surface. Semi-angle can be negative. Its absolute value Abs(Ang) is in range ]0,PI/2[. Raises ConstructionError if Abs(Ang) < Resolution from gp or Abs(Ang) >= PI/2 - Resolution. Applies the transformation T to this cone. Builds the U isoparametric line of this cone. The origin of this line is on the reference plane of this cone (i.e. the plane defined by the origin, "X Direction" and "Y Direction" of the local coordinate system of this cone). Builds the V isoparametric circle of this cone. It is the circle on this cone, located in the plane of Z coordinate V*cos(Semi-Angle) in the local coordinate system of this cone. The "Axis" of this circle is the axis of revolution of this cone. Its starting point is defined by the "X Direction" of this cone. Warning If the V isoparametric circle is close to the apex of this cone, the radius of the circle becomes very small. It is possible to have a circle with radius equal to 0.0.
the half-angle at the apex is inverted.